An arial photo of the Java Sea shows debris floating in the area where AirAsia Flight QZ8501 is believed to have gone down. 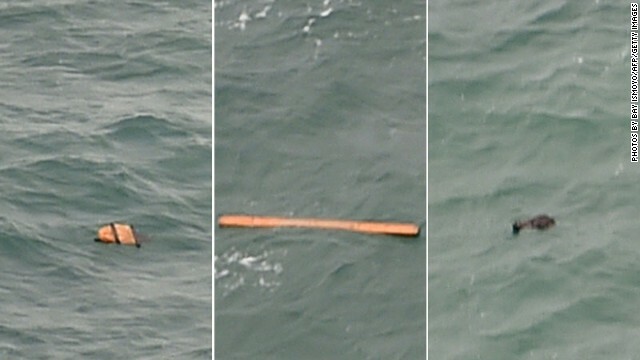 The first pieces of debris from AirAsia flight QZ8501 are found in the Java Sea. After both freezing and burning conditions, all passengers are off a fire-stricken ferry. And Ebola has now reached another European country. Heartbreaking news: After three days of intense searching, officials say they've found debris from AirAsia Flight QZ8501 off the coast of Borneo. The plane disappeared Sunday with 162 people on board. Indonesia's President said search teams are now concentrating on finding and recovering bodies. Ghastly discovery: A Massachusetts mother whose infants were found dead amid squalid conditions pleaded not guilty to two counts of murder. Erika Murray, 31, also faces charges with neglect, abuse, reckless endangerment, concealing a fetal death and even animal cruelty. Police officers had to wear hazmat suits to retrieve the bodies of three infants found in September, amid what police described as filth and squalor at Murray's house. Rescues and deaths: More than a day after a ferry caught fire in the Adriatic Sea, all surviving passengers are off the boat. But 10 people died in the ordeal, the Italian coast guard said. Now, an investigation is under way as to how the ferry carrying more than 400 people went ablaze. Now Scotland, too: Health officials in Glasgow, Scotland, have confirmed a case of Ebola there. The patient is a health care worker who was helping fight the disease in West Africa and returned from Sierra Leone late Sunday night. "All possible contacts with the patient are now being investigated and anyone deemed to be at risk will be contacted and closely monitored," a Scottish health agency said. Just in case: Former President George H.W. Bush's breathing "has returned to normal," but he remains hospitalized pending approval to go home, an aide said. Bush, 90, was taken to the hospital one week ago as a precautionary measure after experiencing shortness of breath.